Laura Ellen Bacon's "Form of Intrigue" sculpture is a Rapunzel-like cascade of woven ash twigs staged at Sudeley Castle in South West England for Sotheby's 2011 Exhibition. In 2011, the second year of collaboration between Sotheby's, a New York-based international art and jewelry broker, and Sudeley Castle, a South West England medieval manor house and strongold, on an outdoor selling exhibition, eleven international artists and designers staged innovative sculptures. Entitled "Material Worlds," the exhibit featured two commissioned works, one of which was "Form of Intrigue" by Laura Ellen Bacon, a Derbyshire artist specializing in gigantic, intricately woven wooden sculptures. 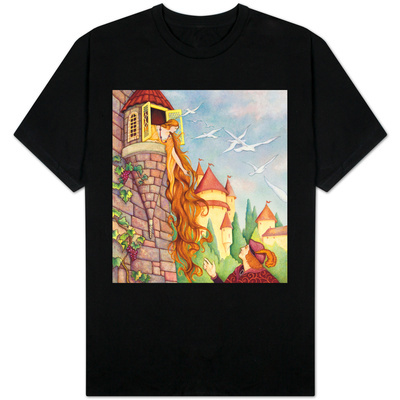 Influential London-based arts curator Janice Blackburn graphically likened the staging of Laura's sculpture to the cascade of hair loosened as a ladder by fairy tale heroine Rapunzel. In 2010 Sotheby's, a multinational corporation revered worldwide as an art and jewelry broker, began a successful collaboration of outdoor selling exhibitions with historic, medieval Sudeley Castle in southwestern England's picturesque Cotswolds. With the textures of its fifteenth century walls, its historic associations with England's tempestuous Tudor period, and the storied beauty of its grounds, Sudeley Castle serves as a spectacular setting for Sotheby's attention-getting exhibitions. Sudeley Castle's chapel, St. Mary's, is the burial place of Catherine Parr (1512-September 5, 1548), sixth and last wife of Henry VIII (June 28, 1491 - January 28, 1547). Nevertheless, the sense of history imparts joy rather than tragedy, for beautiful Catherine Parr (1512 - September 5, 1548), the last queen of England's controversial, enigmatic king, Henry VIII (June 28, 1491 - January 28, 1547), is buried in the Castle's chapel. A three-day feast to celebrate the fourth anniversary of the defeat of the Spanish Armada (August 8, 1588) was held in 1592 at Sudeley Castle and attended by Queen Elizabeth I (September 7, 1533 - March 24, 1603). Scars and ruins attest to cannonading in 1649 by Cromwell's army during the English Civil War (1642 - 1651) which pitted Roundheads (supporters of Parliament) against Cavaliers (royalist supporters of King Charles I [November 19, 1600 - January 30, 1649]) in a challenge to the divine right theory of kingship. Also, reports of gentle haunting add an intriguing, but not frightening, note of mystery to the building and its grounds: the Lady in Green, thought to be Catherine Parr, has been seen standing at a window or walking in the Queen's garden. Catherine Parr is thought to be the "Lady in Green" who haunts the Queen's garden at Sudeley Castle. The second year's exhibition, entitled Material Worlds, featured innovative sculptures by eleven leading artists and designers. Of two artworks specifically commissioned for the 2011 exhibition, one, entitled "Form of Intrigue," was designed and created by Laura Ellen Bacon (born 1976), whose medium tends to be organic materials, usually woven wood. Based in Derbyshire, in central England, Laura often creates onsite sculptures for cityscape, interior, and landscape settings. Laura's inspiration derives from nature's artistic cocoons and nestings created by animals, birds, and insects. Her fascination with the creative expression of nature's ways through wood is grounded in a childhood of glorious revels on her family's fruit farm in which her preferred pastime was building tree houses and dens. The vibrancy of Laura's wooden materials elegantly conveys calm and organic growth, concepts which seem crucial to the sculptress's artistry. From a chaos of twigs, Laura weaves a structure which creates a quiet space, usually in conjunction with a host structure, such as stone walls or trees. Often the interior of the sculpture may be glimpsed. Sometimes, however, Laura weaves from the inside to the outside and then seals the opening, so that the interior landscape remains her secret space. Such was her design of "Forms of Growth," woven from bamboo, oak, and "Flanders Red" willow, at stately Chatsworth in England's East Midlands region. The artist, Laura Ellen Bacon, with her work. "Form of Intrigue" was valued at £6,000 ($9,660) in 2011. Unaided by assistants and perched on scaffolding for inaccessible areas, Laura painstakingly wove her creation within just over a week's time. The intricate weaving features ash twigs. 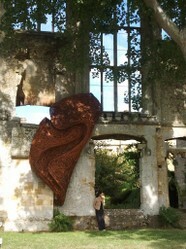 Influential arts curator Janice Blackburn (born 1949) compared the effect of the sculpture, draped around an enormous, gaping, shelled window of Sudeley Castle's ruins, to the cascade of Rapunzel's gorgeous hair down the forbidding walls of the tower in which she is hidden. Arts curator Janice Blackburn analogizes Laura Ellen Bacon's "Form of Intrigue" sculpture to Rapunzel's gorgeous cascade of hair. Queen's Gardens at Sudeley Castle is haunted by a "Lady in Green" who is thought to be Catherine Parr, sixth and last wife of Henry VIII. Ashcombe, Elizabeth. Behind Castle Walls at Sudeley Past and Present. Stroud UK: Amberly Publishing, 2010. Bacon, Laura Ellen. Forms of Intrigue and Woven Spaces. Sheffield UK: Northend Creative Print Solutions, 2013. Bacon, Laura Ellen. "The Sculptural Work of Laura Ellen Bacon." The Contemporist, March 20, 2013. Retrieved November 5, 2014. Bacon, Laura Ellen. "Willow, Weave for Me." Country Life (January 11, 2012): 36 - 39. Retrieved November 5, 2014. Bell, Joshua A., Mary Butcher, and Joanne Clarke. Basketry: Making Human Nature. Norwich UK: University of East Anglia Sainsbury Centre for Visual Arts, 2011. Gibson, Grant. "Nesting Instinct." Crafts Magazine (July/August 2011): 35 - 38. Retrieved November 5, 2014. Himelfarb, Ellen. "The 'nature of things' at Artists' House, UK." Wallpaper Magazine > Art. February 3, 2012. Wallpaper.com. Web. www.wallpaper.com. Retrieved November 5, 2014. Hunt, Jeremy E. "Material Worlds: Sotheby's at Sudeley Castle. 28 July - 30 September 2011." AAJ Press > Archive. July 27, 2011. Art & Architecture Journal / Press. Blog. aajpress.wordpress.com. Retrieved November 5, 2014. Pekárová, Adriena. "Symbióza architektúry a prútia O tvorbe Laury Ellen Bacon." Remeslo Umenie Dizajn (02/2012): 48 - 52. Retrieved November 5, 2014. Roberts, Sara. "Why three is the magic number." Crafts Magazine > Reviews (March/April 2012): 61 - 62. Retrieved November 5, 2014. Weigman, Matthew. "Sotheby's at Sudeley Castle: Material Worlds, A Selling Exhibition -- Sotheby's To Offer Spectacular Works by Leading International Designers in its Outdoor Selling Exhibition at Sudeley Castle in Summer 2011." Sotheby's > Press Releases > Archived News > 2011. July 4, 2011. Sotheby's. Web. investor.shareholder.com. Retrieved November 5, 2014. Weigman, Matthew. "Sotheby's at Sudeley Castle: A Selling Exhibition -- Sotheby's Announces its First Ever Outdoor Exhibition of Contemporary Design at Sudeley Castle in Summer 2010." Sotheby's > Press Releases > Archived News > 2010. April 21, 2010. Sotheby's. Web. investor.shareholder.com. 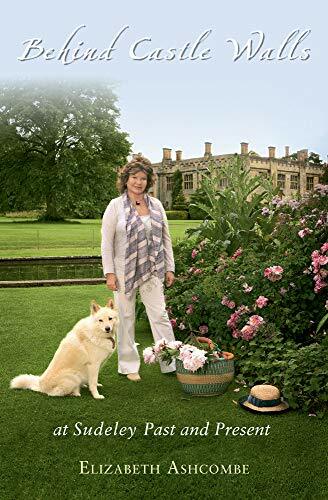 Retrieved November 5, 2014.
ruins and famous knot garden at Sudeley Castle, venue for Sotheby's 2011 exhibition "Material Worlds"
Reflections on castle life include the relentless season of events, such as Rose Week and the new Henry VIII exhibition. When Lady Ashcombe and her late husband first tackled the castle it was a ruin. Bowstring hemp (Sansevieria hyacinthoides) is presented, especially in its current status as a Florida invasive, via stunning c.1700 watercolor by Jan Moninckx.